The NBA couldn't have asked for a more perfect night. The NBA had itself a night on Tuesday (Apr.10). While Magic Johnson ditching his job without informing his boss made headlines, two future Hall of Famers gave their home fans vintage performances in their final home games. Before the Magic Johnson bombshell, Dwyane Wade’s final home game was the talk of the entire sports world. 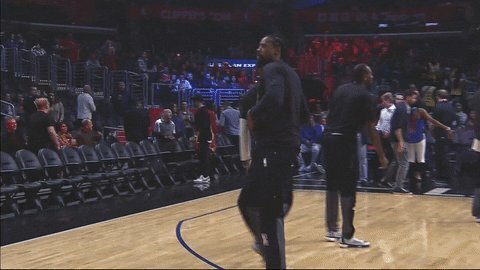 Two ads from Budweiser and Gatorade pulled at the heartstrings of NBA enthusiasts leading up to Wade’s last dance in American Airlines Arena aka his house. The emotional night began with Wade being introduced by his son Zaire Wade to the crowd before he spoke to Heat Nation, thanking them and his current teammates for their patience and embarking on his last dance with him. Wade even gotta special message from one of his biggest supporters and huge NBA fan former President Barack Obama. With all the pleasantries out of the way, it was time to handle business on the court and D-Wade did not let Heat Nation down. Turning back the clock, we got some vintage Flash as he dropped 30 pts with help from Bam Adebayo adding 19 leading the Heat to a 122-99 victory over the Philadelphia 76ers keeping their playoff hopes alive for another night. Some notable moments that took place outside of all the touching tributes included Wade landing in the laps of his friend John Legend and his wife Chrissy Teigen which made for a fantastic photo moment that we think should be framed. To close out the magical night, Wade addressed the crowd one last time hopping on the scorer’s table, and of course, there was one more jersey swap with his bro Jimmy Butler. A perfect way to say goodbye to Wade County, the Heat close out their season in Brooklyn against the Nets. Meanwhile, in Dallas, another legend bid farewell to their home fans, while it wasn’t quite the spectacle as Wade’s final game was Dirk Nowitzki found some extra gas in the tank and also put on a stellar performance in his last home game as well. With his childhood hoop heroes Scottie Pippen, Shawn Kemp, Charles Barkley, Larry Bird and fellow German Detlef Schremph in the building as well his family from Germany, Dirk dropped 30 and even let the world know he still has some hops after 21 seasons in the NBA. Once the game was over it was time to salute the life-long Maverick. Dirk officially confirmed what everyone already knew that this season would be his last in the post-game celebration. While fighting back the tears, Nowitzki kept it real classy and thanked the loyal fanbase and the entire Mavericks organization before handing off the microphone to the team’s owner Mark Cuban and the NBA legends in the building. A fitting end to a legendary career, salute to the champion Dirk Nowitzki. The NBA couldn’t have asked for a more perfect night.